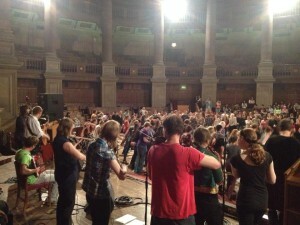 Edinburgh University Folk Society runs a professional ceilidh band that is available for bookings. As well as a lively Ceilidh band we can provide dance calling and a P.A. If you would like to make a booking enquiry for a 3 or 4 person ceilidh band, please fill out our online form here. If you would like to make a booking enquiry for a charity ceilidh band, please fill out this separate online form here. For provisional band availability please view our calendar. We do not play at weddings but we are happy to provide you with a list of bands which we recommend, many of which contain current/former members of FolkSoc. Please get in touch at band@eufolksoc.org.uk if you would like this list. If you have any queries not answered in the FAQ’s page, please get in contact with the band manager at band@eufolksoc.org.uk.